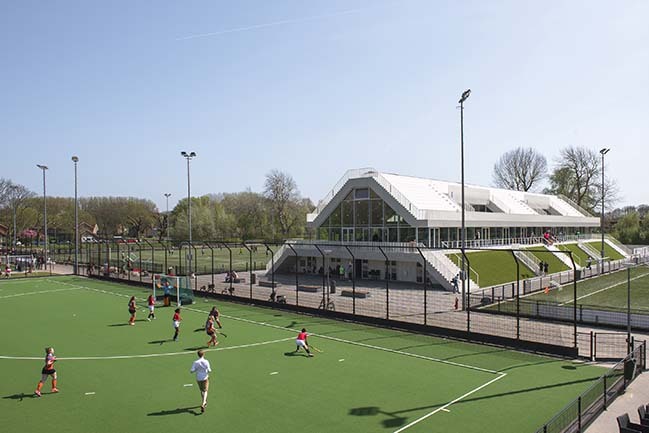 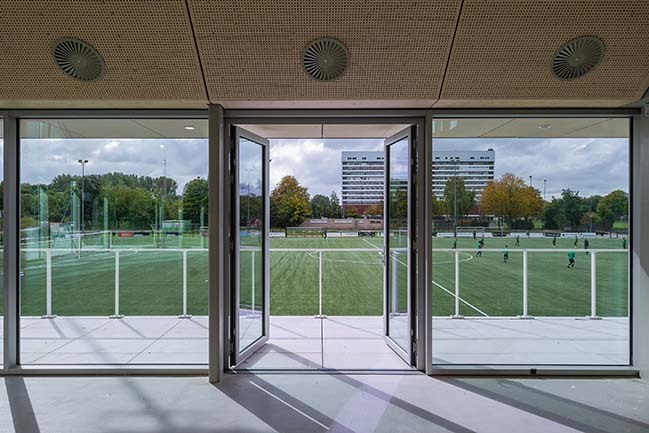 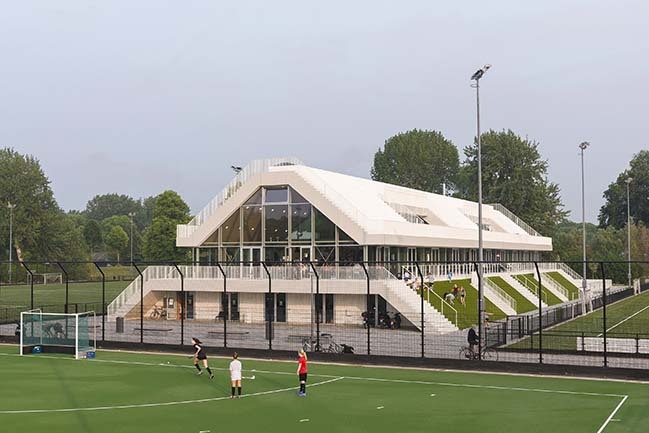 Three sports clubs with different backgrounds and ‘club cultures’ will join forces on the new Sportcampus Rotterdam: soccer clubs FC IJsselmonde and Overmaas and Hockey Club Feijenoord will share a new facility. 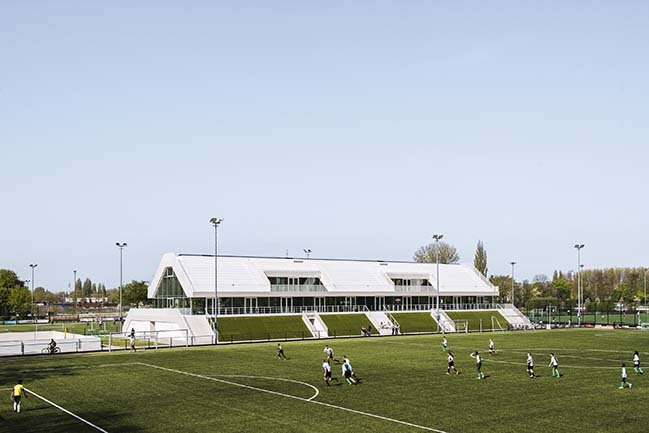 From the architect: The urban plan positions the building in between the two main soccer fields and adjoining other pitches. 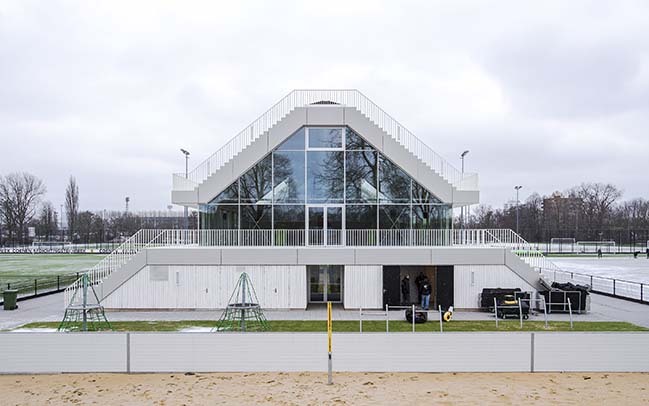 The new club house tries to exploit the specific position. 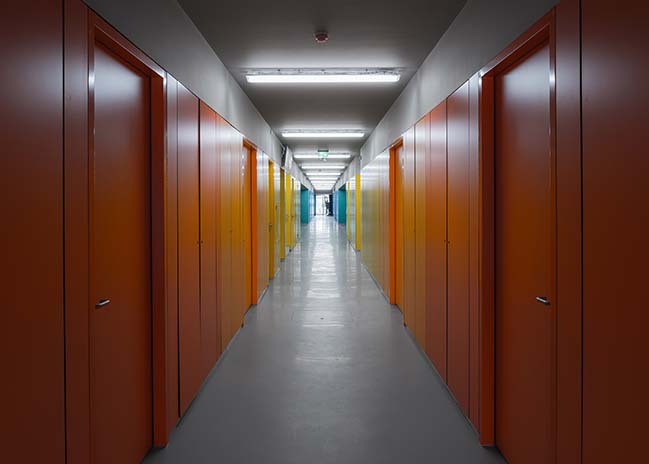 Notwithstanding the understandable hesitations about sharing a new accommodation – giving up autonomy, sacrificing sovereignty - there are many possible gains. 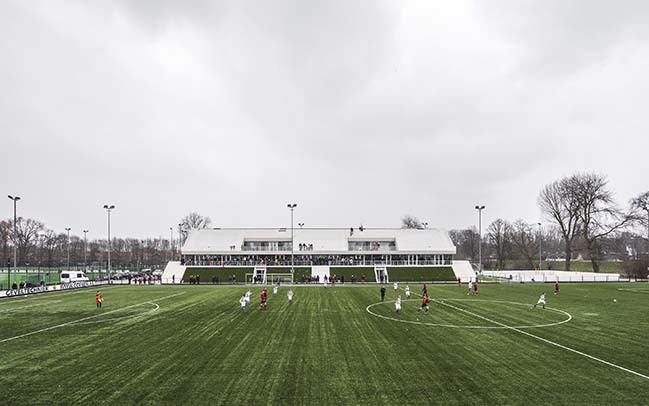 Varkenoord pursues these potential synergies. 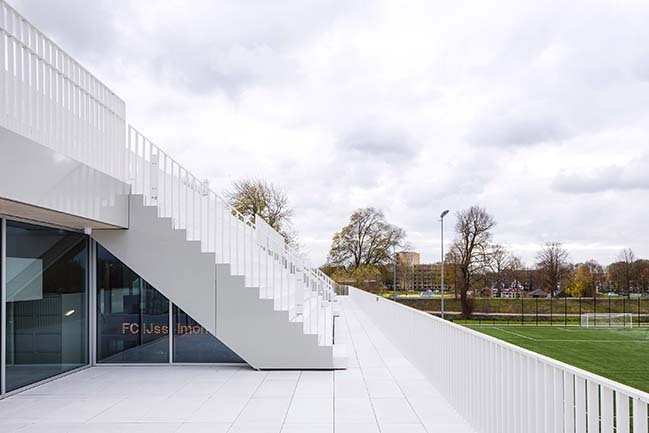 How can you create a new combined identity for the cluster that still leaves room for the individual clubs to be themselves? 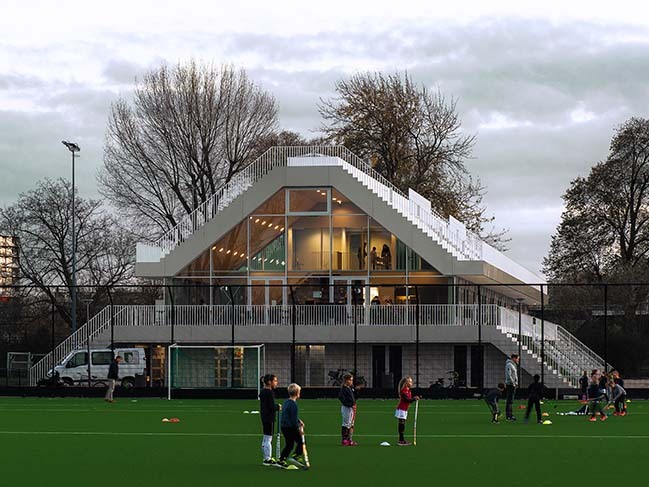 The build up of the new club house is logical. 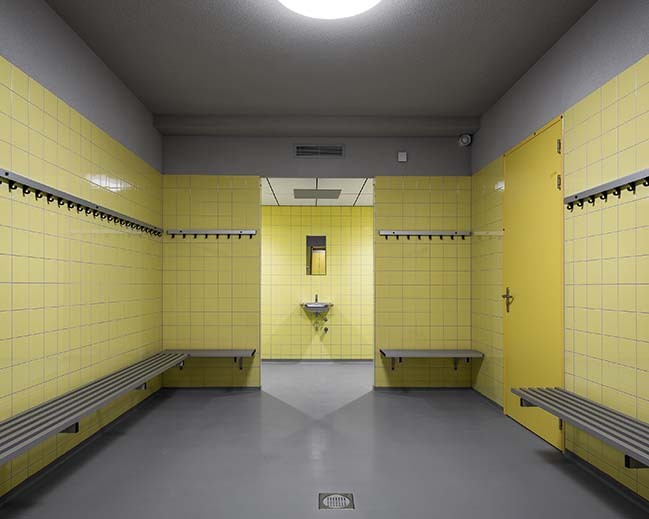 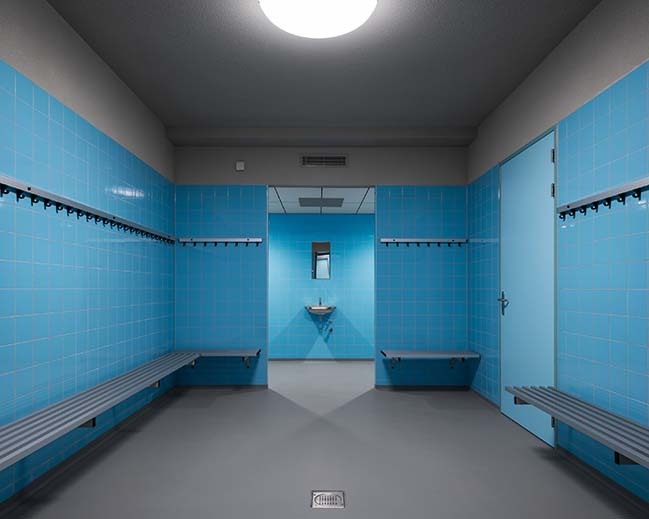 The changing rooms are at ground level, flush with the pitch. 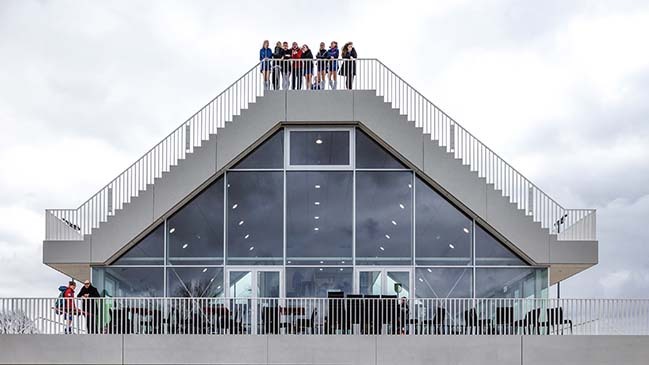 The canteen sits on top to enjoy the view. 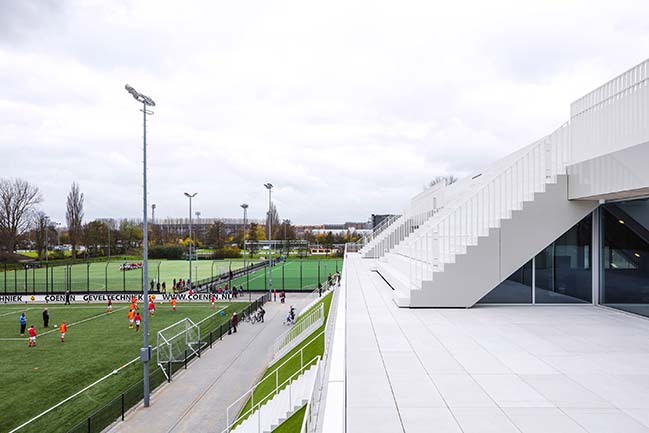 The façades of the changing rooms -unattractive by nature- are hidden behind a slope. 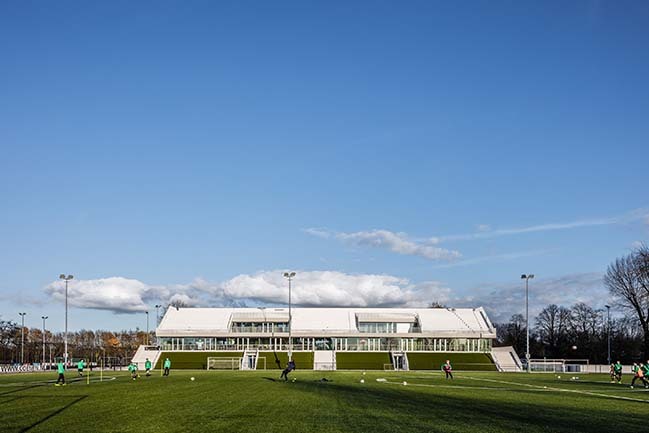 This ‘dyke’ is clad with Astro Turf to blend in with the surroundings that, as most pitches these days, are also covered with artificial grass: the fields ‘curl up’. 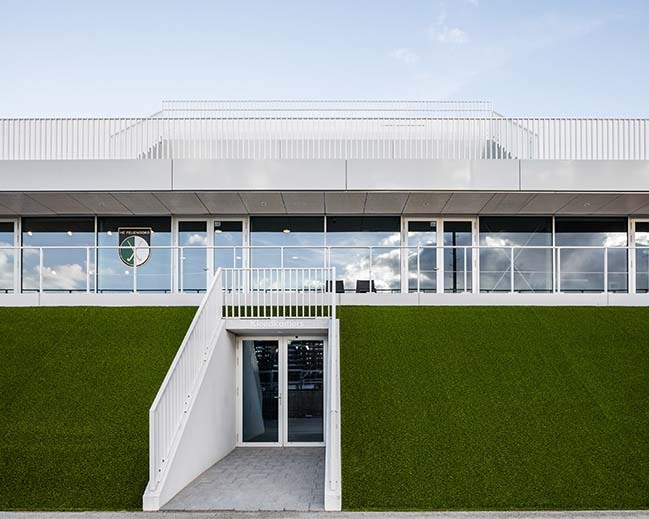 On top of the green embankment a transparent pavilion is placed with bars and offices and meeting rooms with a panoramic view. 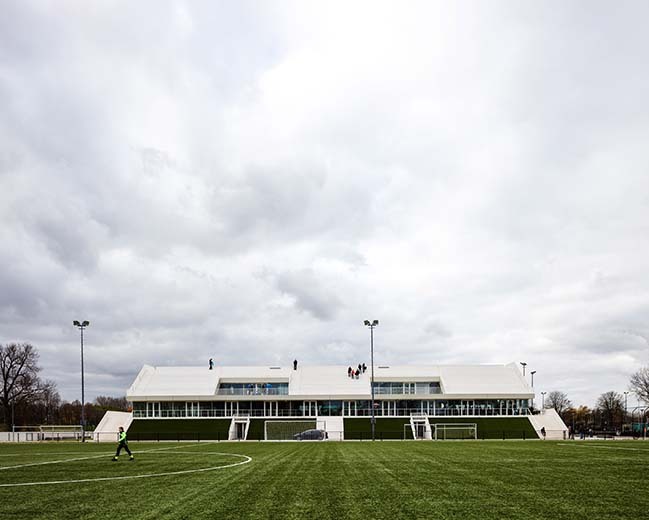 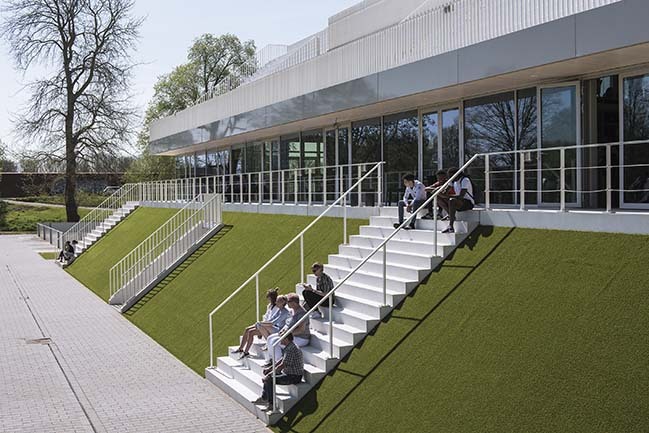 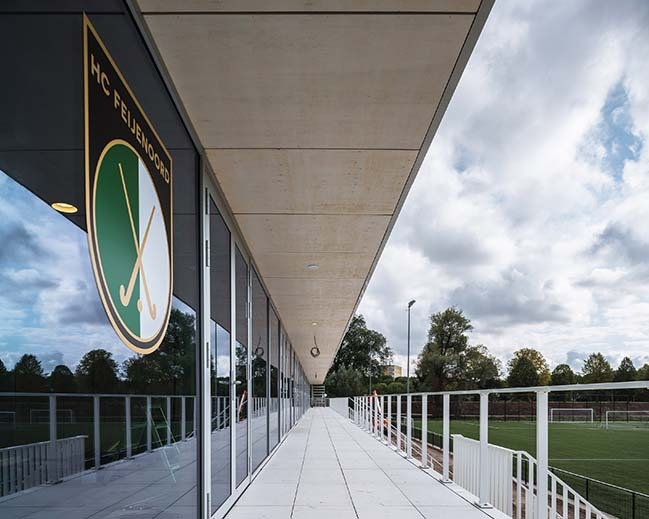 The terrace over the full perimeter of the building has superior view over the playing fields. 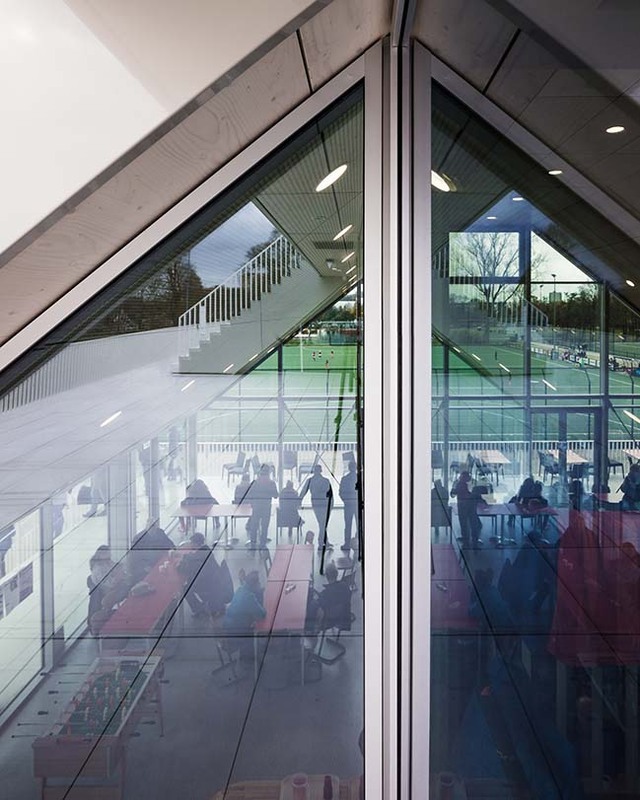 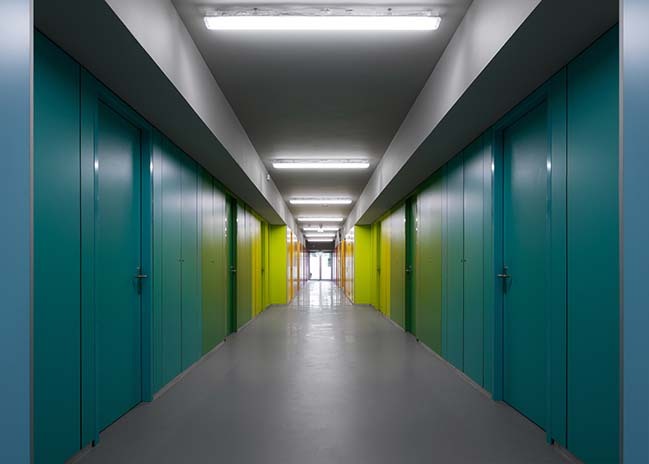 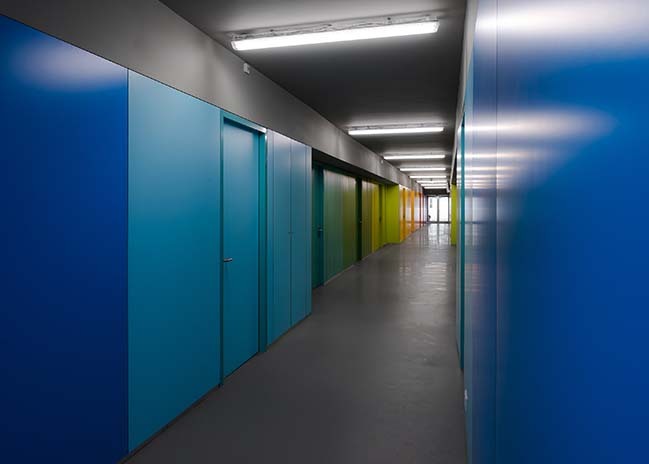 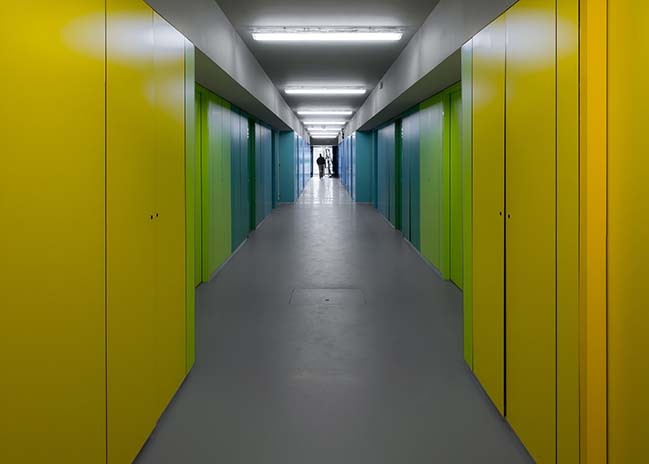 The ‘public’ part of the canteen meanders through the building dividing the space naturally in sections for each club. 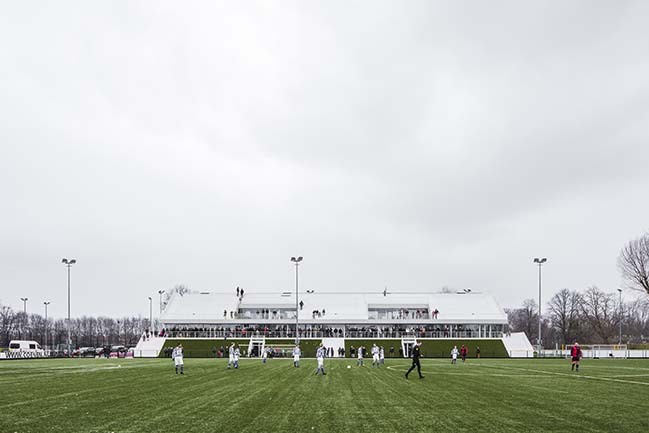 The club house is topped by a pitched roof: a kind of stepped gable* that is extruded over the entire length. 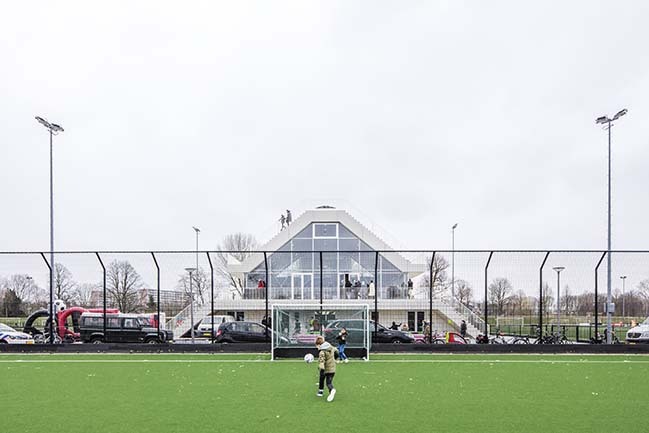 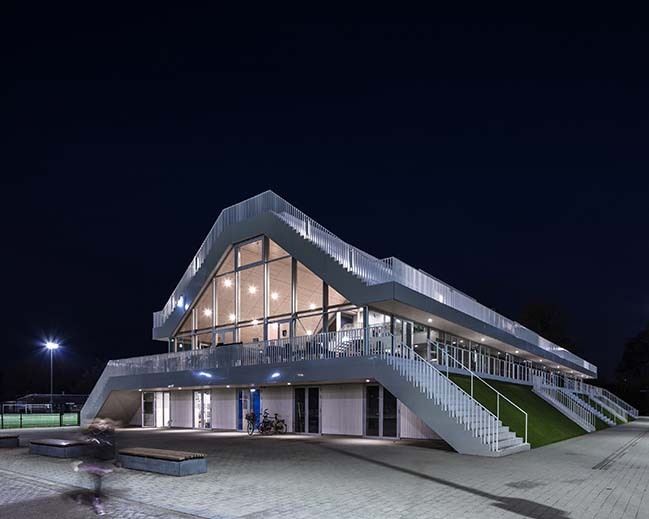 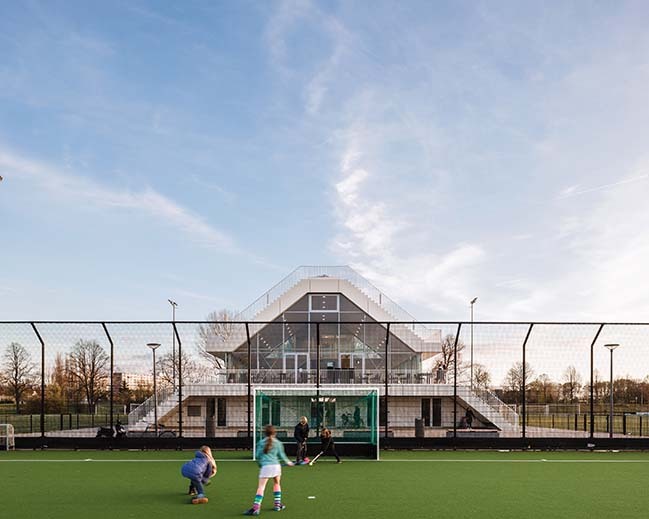 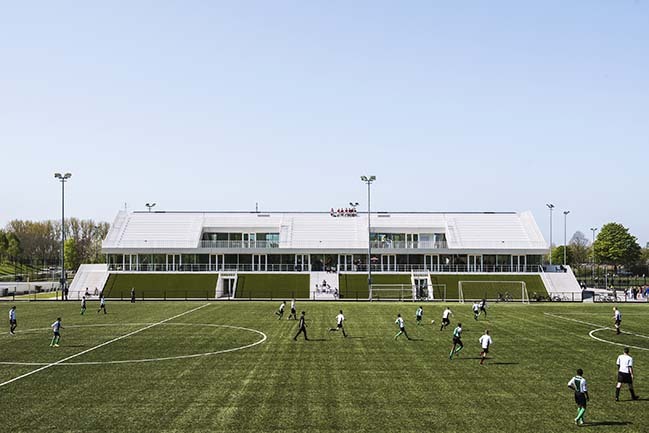 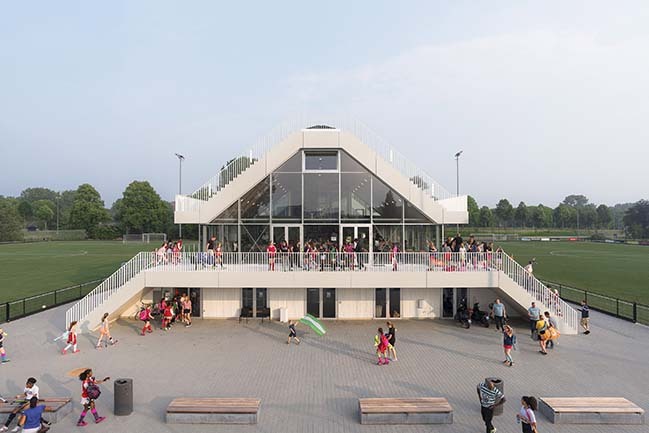 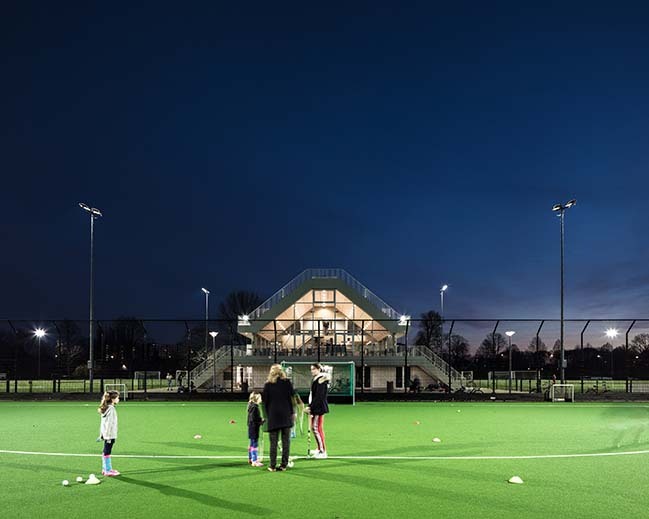 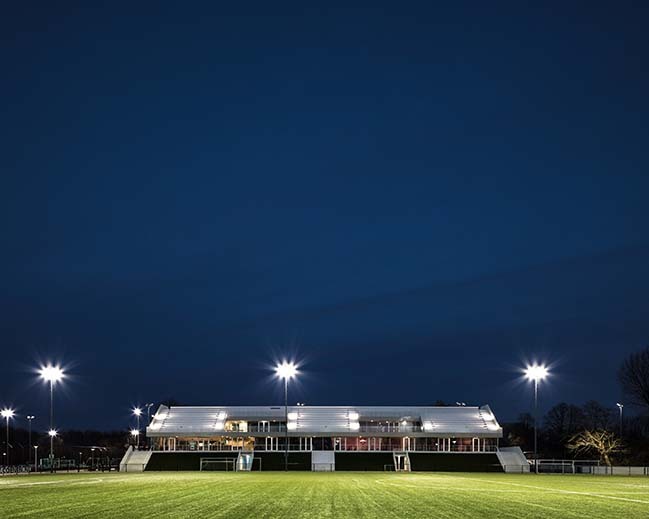 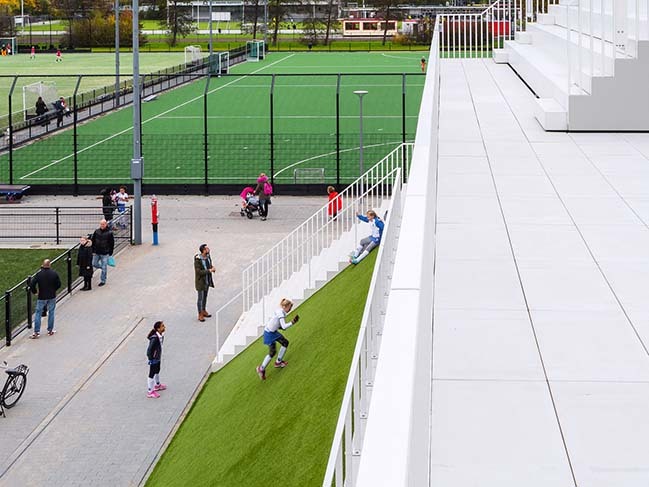 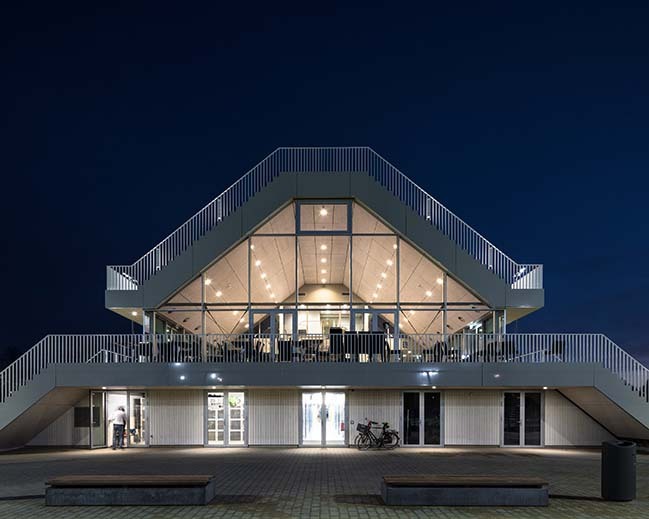 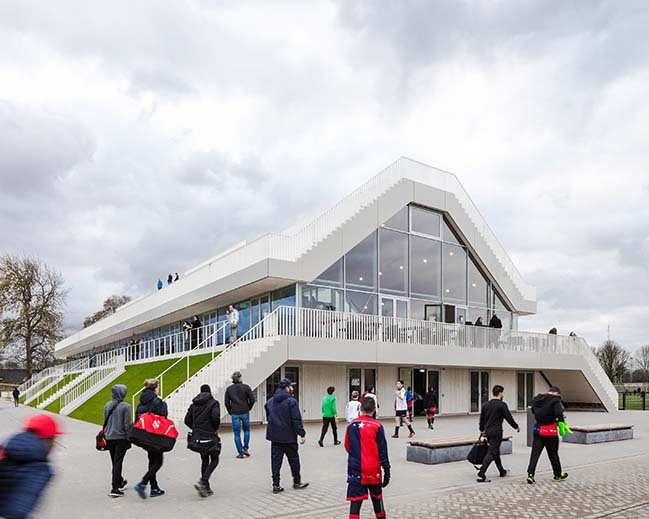 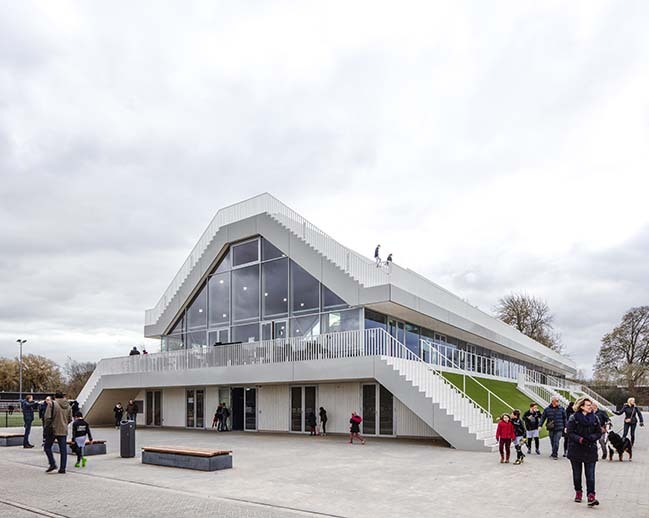 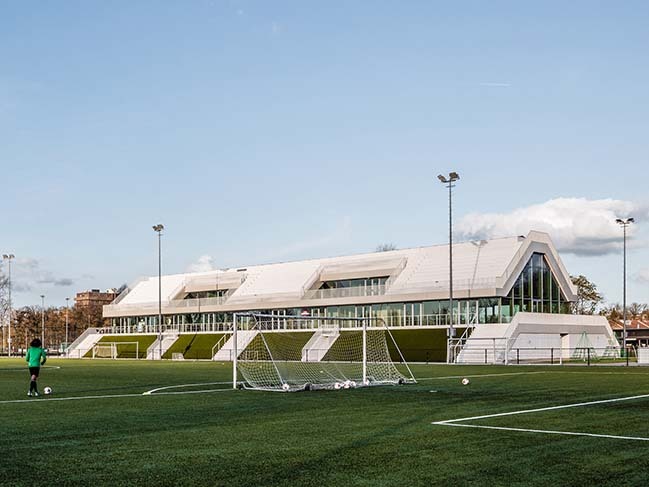 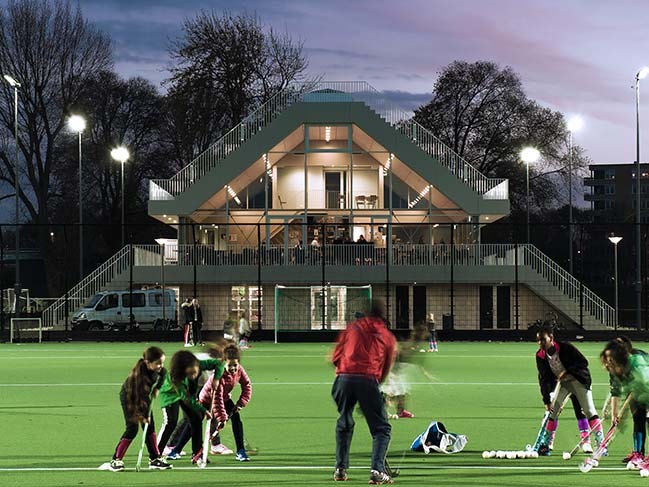 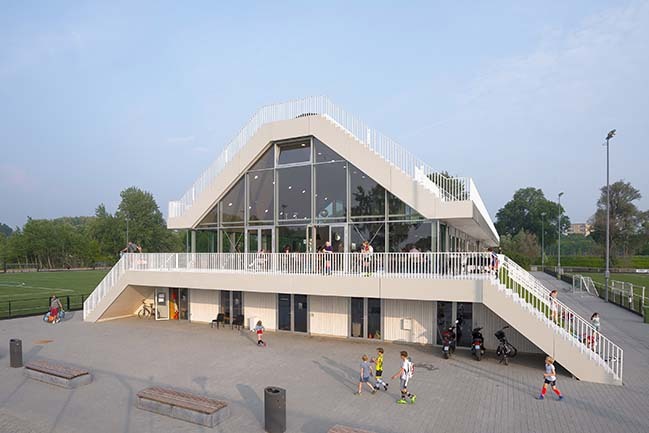 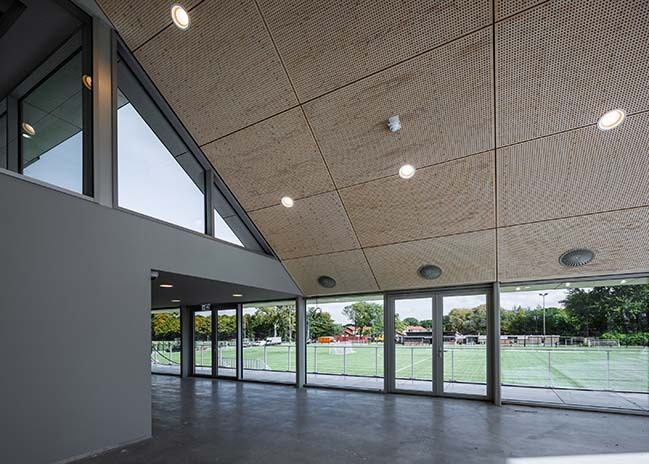 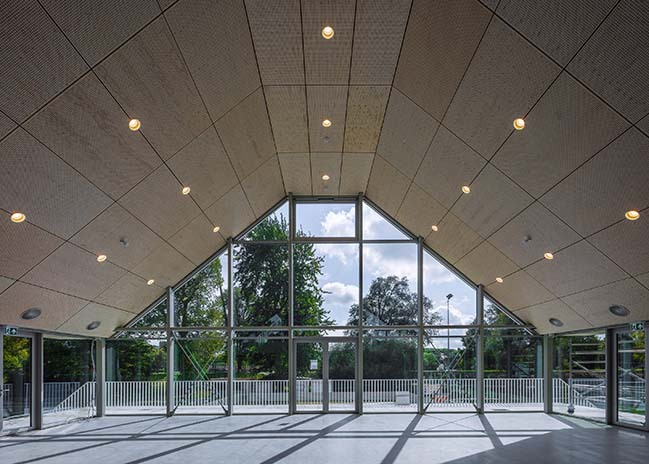 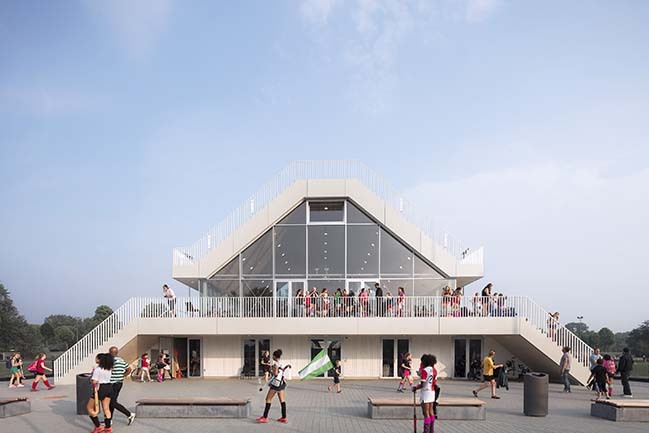 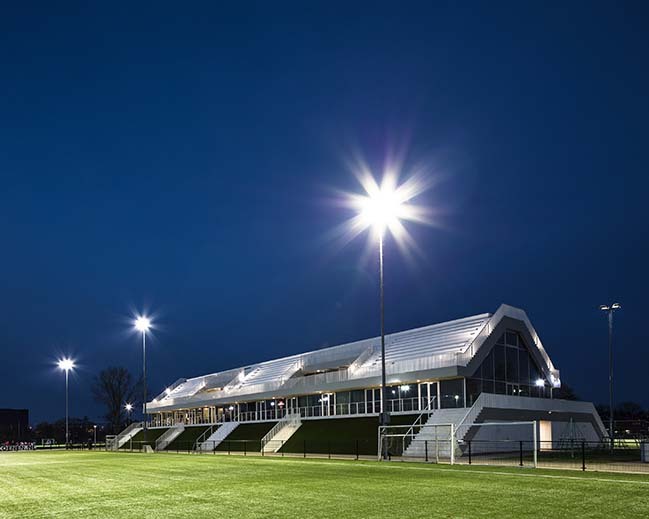 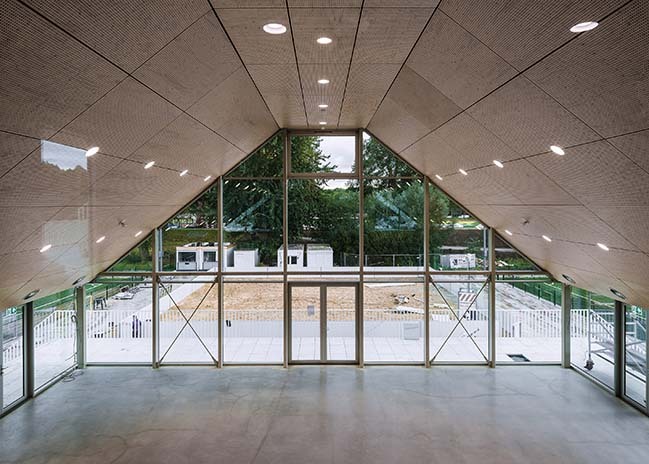 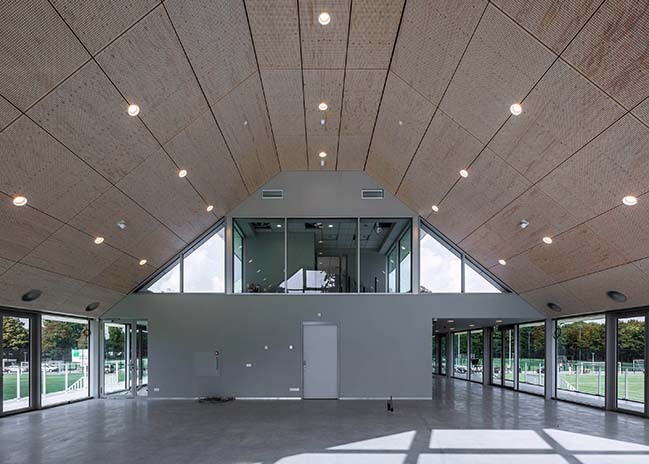 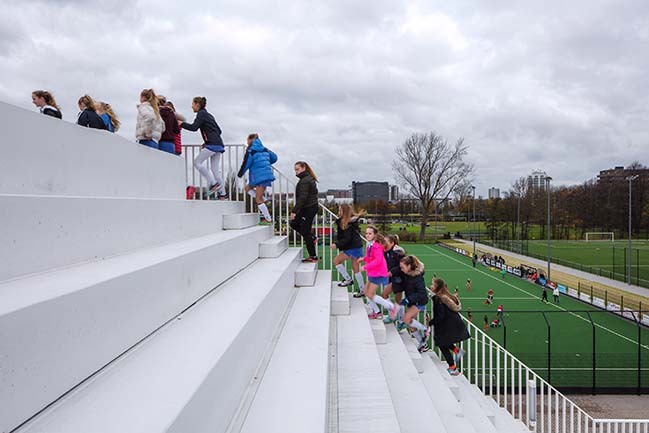 The roof becomes habitable, accessible: a two-sided grandstand comes into being that fully capitalizes the characteristic orientation of the playing fields. 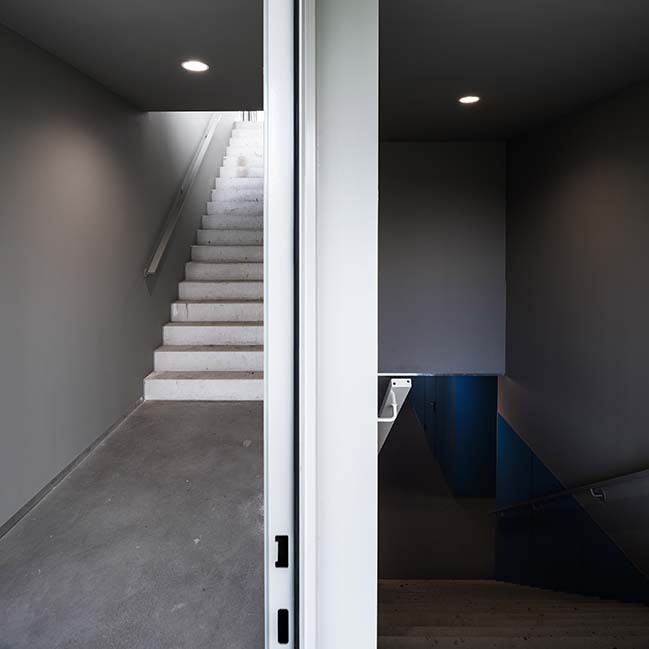 The archetypal House acquires a new dimension. 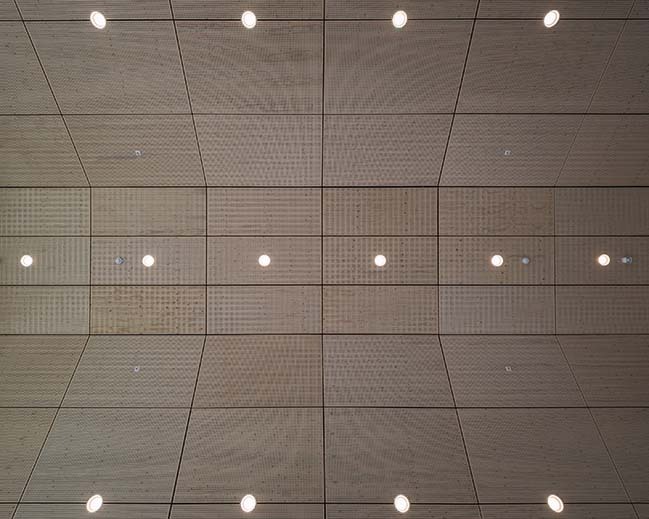 The effects for the interior are spectacular too. 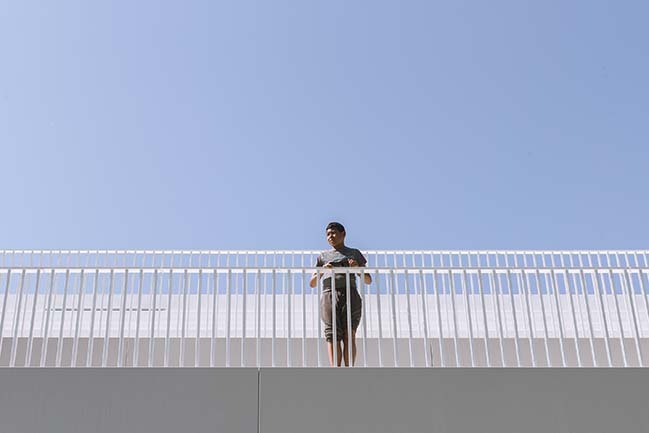 The room height feels luxurious. 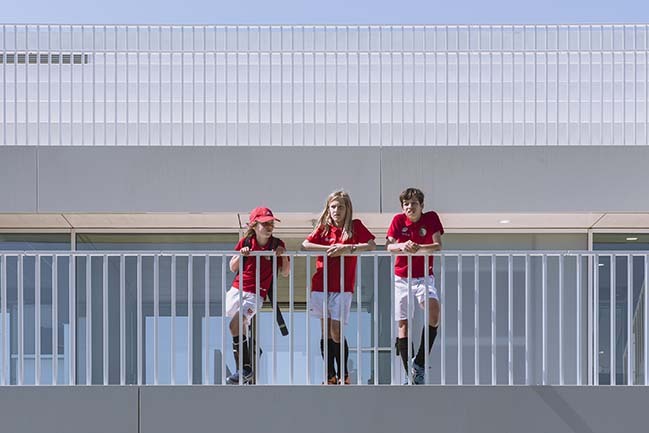 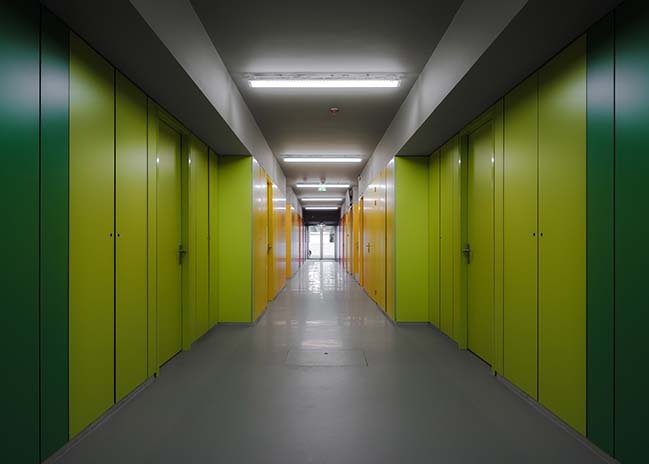 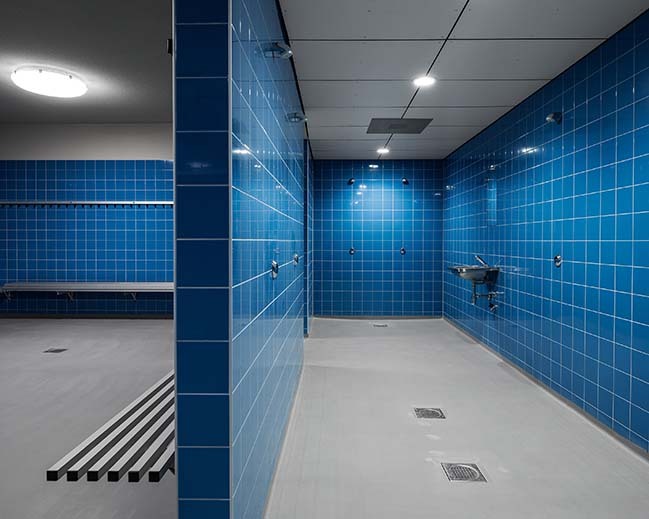 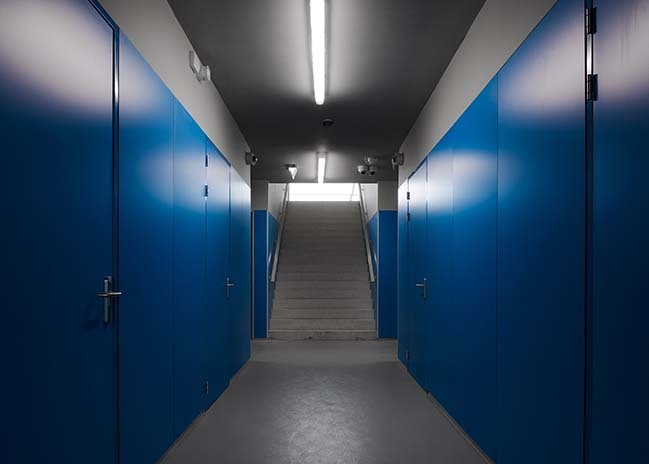 The double height alternates with mezzanines that provide access to multifunctional rooms and to the terraces, open-air skyboxes accessible for all.